Click on the "Data Sheet" button for more information and technical details. It is usually assumed that protection gloves that withstand penetration in the test, offer effective protection against bacteria and fungi. However, because many viruses are much smaller than bacteria and fungi, these protection gloves may offer inadequate protection in practical fields. A protection glove that is resistant to bacteria is a watertight glove that has a maximum AQL value of 1.5 in the permeability test. The AQL value (AQL = Acceptable Quality Level) reflects a given limit or the minimum quality requirement. In general, the lower the AQL value, the better the quality of the protection gloves. Gloves that protect against bacteria and fungi. Not tested against viruses. Protection gloves of this standard need to protect against physical and mechanical loads such as wear, cuts, puncturing, tearing or felling cuts. These loads can occur when working with metal or wood or any other tasks where hands need to be protected against mechanical injury. Also, they must comply with the regulations relating to electrical conductivity of protection gloves. Protection gloves for mechanical risks must satisfy at least one of the test criteria listed in the table. The higher the number (shown with an X below the icon in the example), the better the test result. 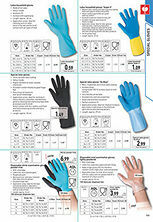 Full chemical protection gloves primarily aim to protect the hands against chemicals. They are assigned to the PSA Category III. 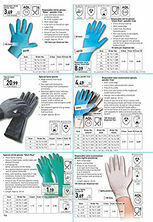 Due to the infinite range of chemicals, there is no one specific glove that will offer protection against all liquids. Instead, the best product must be selected for the task at hand. Full chemical protection has a protection index of at least 2, i.e. a permeation time > 30 minutes for at least 3 of 12 statutory defined test chemicals. (Permeation = penetration on a molecular level). Gloves marked with a conical flask offer full chemical protection. The chemicals against which the gloves offer protection are identified with a letter below the pictogram. Durable coating with oil, grease and hydrocarbon resistance. Despite the solid coating, no sensitivity is lost. The coating is ideal when working with oily or dry materials. Our assessments are based on practical experience. The valid EN standards have not been taken into consideration. The properties of the individual gloves were assessed in comparison to all other gloves of the respective material group. The higher the assessment, the more suitable the glove is for this field. Important: The assessment is not a legally binding statement about the actual application suitability. For thisplease refer to the respective EN standards with the test code of the various gloves here in the text of the details screen.